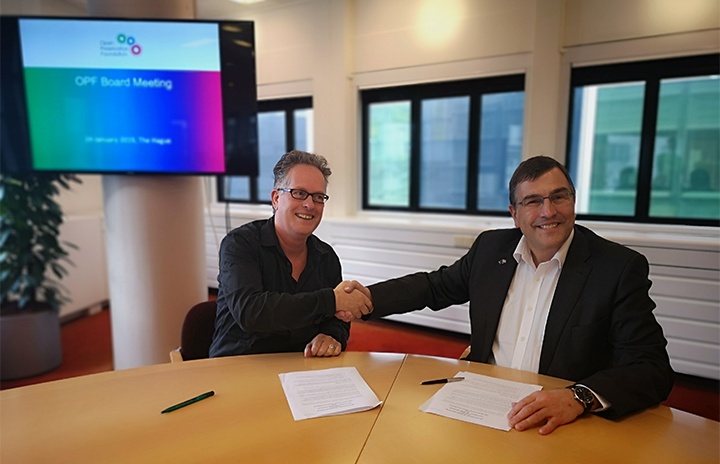 The Open Preservation Foundation (OPF) and the Dutch Digital Heritage Network (DDHN) have signed a new Memorandum of Understanding to reaffirm their commitment to work cooperatively. This agreement builds upon the existing MOU between the OPF and the Netherlands Coalition for Digital Preservation (NCDD). The NCDD merged into the Dutch Digital Heritage Network in 2018, creating a single national collaboration platform for all institutions. The new agreement was signed on 24 January 2019 at the National Library of the Netherlands during an OPF Board meeting. The Open Preservation Foundation is a global not-for-profit membership organisation that leads a collaborative effort to create, maintain and develop the reference set of sustainable, open source digital preservation tools. Founded in 2010 as the Open Planets Foundation to steward the results of EU-funded R&D, the Foundation enables the development of best practice through interest groups, community events and training. The OPF’s vision is open sustainable digital preservation. The Dutch Digital Heritage Network is a partnership that focuses on developing a system of national facilities and services for improving the visibility, usability, and sustainability of digital heritage. The network consists of a growing number of Dutch organizations underlining the principles of collaboration in providing open and continuous access to digital heritage. The DDHN highly values their relations with international partners, as digital heritage should cross all borders.